Today, we remember and thank God for the holy prophet Jeremiah. 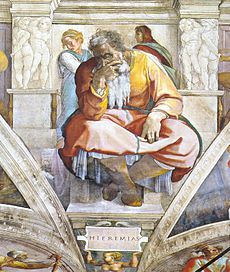 Serving as God’s spokesman to the Southern Kingdom of Judah in its sad twilight years, Jeremiah is justly called “the weeping prophet.” He came from a priestly family in Anathoth of Benjamin, perhaps descended from the priest Abiathar, whom Solomon had exiled to that city. He was called as a youth to the prophetic office. Like Moses before him, Jeremiah begged to be excused from the call. God refused and commanded, “To all whom I send you, you shall go, and whatever I commanded you, you shall speak. Do not be afraid of them, for I am with you to deliver you” (Jeremiah 1:7-8). Thus began a long and exceedingly frustrating ministry. The people of Judah, the kings and nobles, the priests and prophets, refused to hear the Word of the Lord in Jeremiah’s mouth. He spoke clearly and in prophetic signs to them of the doom that was bearing down relentlessly; the destruction of their city and temple by the Babylonians, the seventy-year-long exile of the popuola6tion in Babylon, and its eventual restoration. In his extreme frustration at Judah’s stubborn refusal to repent and her blind determination to destroy herself, Jeremiah cried out, “Woe is me, my mother, that you bore me, a man of strife and contention to the whole land” (Jeremiah 15:10). In the course of his ministry, he was beaten, imprisoned, starved. He was denounced as a traitor and falsely accused of being in the service of the Babylonians. He saw his prophecies of destruction come true before his very eyes, and he shared in the intense suffering of his people during the final siege. He constantly warned against the false hope that lying prophets continued to give the people, even in the days after the city was taken. Amid all the suffering and gloom that fill his writings, there shine also rays of sweet hope and comfort. He predicted the coming of One who would be a righteous branch, indeed whose name is the Lord our Righteousness. He told of a day when mourning would turn to joy, when God would give His people gladness for all their sorrow. He foretold the cutting of a new covenant that would be unlike the old covenant that Israel had broken. This would be a covenant of forgiveness: “For I will forgive their iniquity, and I will remember their sin no more” (Jeremiah 31:34). Above all, Jeremiah proclaimed to the broken people left in a destroyed city, who despaired that God would ever forgive their great sin, that God’s steadfast love does not fail and is new every morning. Great is His faithfulness. Jeremiah is last heard of as a captive to those fleeing to Egypt. He is believed to have died on the way there, perhaps as a martyr. Prayer: Lord God, heavenly Father, through the prophet Jeremiah, You continued the prophetic pattern in teaching Your people the true faith and demonstrating through miracles Your presence in creation to heal it of its brokenness. Grant that Your Church may see in Your Son, our Lord Jesus Christ, the final end times prophet whose teaching and miracles continue in Your Church through the healing medicine of the Gospel and the Sacraments through Jesus Christ, our Lord. Amen.